We have delivered, improved safety, warehouse flexibility and operational efficiency to Domino’s Pizza, after the pizza delivery company purchased a loading platform for use at its storage warehouse in Milton Keynes. The secondary facility, based at Tilbrook, is used primarily to store and distribute double-stacked flat-packed pizza boxes. The need for a loading bay solution arose after Domino’s began bringing containers into this warehouse, which didn’t include a dedicated dock. 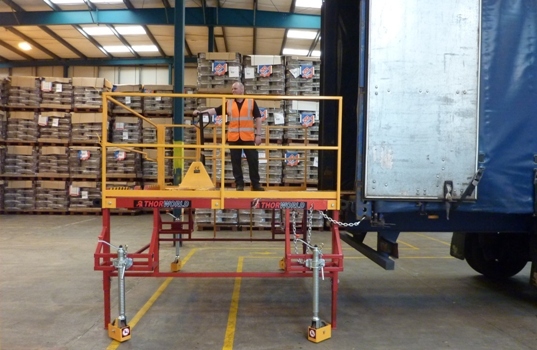 This would make loading and unloading a potential Health & Safety issue, so Domino's decided to invest in a compact, mobile platform to act as a hub for warehouse activity. 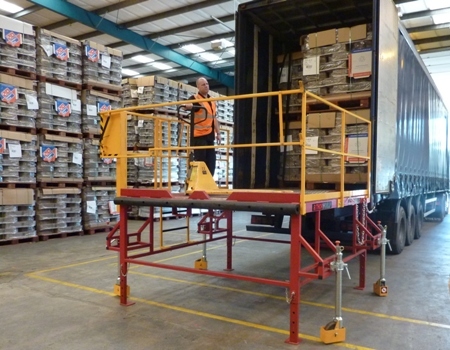 Researching alternatives on Google, Goods In Supervisor Mik Vallas opted for a loading platform over a ramp, citing the benefits of portability and multi-functionality. "We decided a ramp would not only be too cumbersome for storage, we were also concerned that the angle would be too steep for our on-site counter balanced fork lifts to convey double-stacked pallets. "In contrast, platforms can be quickly moved into position for safe loading and unloading. Their portability also allows us to use the platform for other functions," explains Mik Vallas. One company in the platform market stood out for Domino’s. "Thorworld’s platforms looked sturdy and robust, and they offered comprehensive, clear back-up – both of these factors differentiated them from other platform suppliers we looked at." Thorworld invited Domino’s to its manufacturing site in Chesterfield, and also took the retailer to a warehouse where a similar loading platform was in operation, so that Domino’s could see it in action first-hand. Photographs and video footage were presented to Domino’s directors and Health & Safety personnel, who immediately grasped the all-round benefits of bringing a mobile platform on-site. "Thorworld was a dream to work with," comments Mik Vallas. "All communication with Thorworld personnel was second to none and the company fast-tracked delivery as we wanted it, to be up and running as soon as possible. "In addition, Thorworld reacted quickly to make a further adjustment on-site to match our requirements after the initial bedding-in period." The platform has brought significant benefits to Domino's Pizza since delivery. Box loading/unloading is now subject to a Standard Operating Procedure to bring it in line with Domino’s standard processes and procedures. Furthermore, the large area and flexible design of the platform means that warehouse personnel can use it for handballing containers of other products in addition to unloading pallets of boxes. "So far, the Thorworld loading platform has served us faultlessly," confirms Mik Vallas. The platform has brought significant benefits to Domino’s Pizza since delivery. Box loading/unloading is now subject to a Standard Operating Procedure to bring it in line with Domino’s standard processes and procedures.